Sometimes a repair can be as simple as a replacement of a gutter union or bracket. 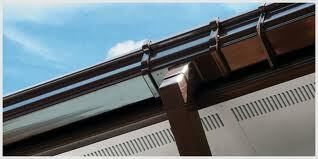 We offer a full replacement and refurbishment service for Fascia, Soffits and Guttering. In addition we also fit Bird Stops and Ventilation. Soffit boards are tucked underneath the Fascia board and are the visible bottom of the boarding outside houses. These can be ventilated, though it is now becoming more common to have the top section of the boarding ventilated. UPVC is useful in Rainwater, Deepflow, Squareline and Floplast Systems, and is available in a large variety of colours and styles! Visit our Contact page for a quick estimate!